DAVAO CITY (MindaNews/15 January) – Opposition senator Antonio Trillanes IV pleaded not guilty to four counts of libel filed against him by the president’s elder son, former Davao City vice mayor Paolo Duterte, and brother-in-law lawyer Manases Carpio. 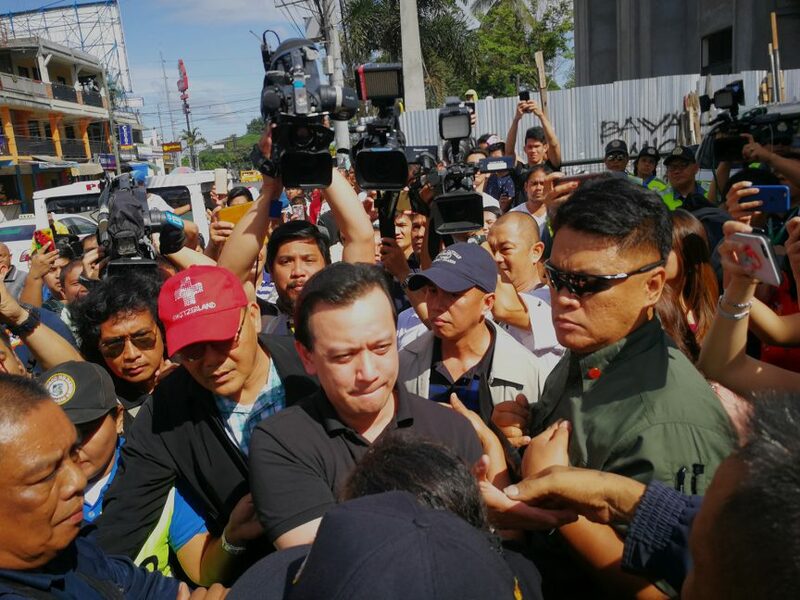 Trillanes, who arrived in the city early Tuesday to appear for his arraignment at 8:30 a.m. before the Regional Trial Court Branch 54, told reporters his appearance proved he is ready to face the charges. But Trillanes downplayed the charges as “harassment cases just to inconvenience me, just to get me distracted”. He vowed to continue with his mandate as a member of the opposition, which he said plays an important role in criticizing the abuses and excesses of the administration. The senator described the reception of the Dabawenyos of him as “surprisingly warm” despite being declared by the city a “persona non grata” in February 2018 for “spreading fake news” about Davao as the most dangerous place in the Philippines during his visit to Chicago in the United States. “That’s a political resolution, pero kahit na wala tayong magagawa kasi subpoena tayo ng korte kahit ayaw sa akin ng mga konsehal ng Davao City — to be welcomed dito sa Davao — obligado po tayo (but even if there’s nothing we can do because we had been subpoenaed by the court, even if the councilors of Davao City dislike me — to be welcomed here in Davao – we are obliged),” he said. He said he believes the Filipinos would understand him for being a staunch critic of the Duterte administration but he also recognized there are supporters who might get offended by his position. “Naiintindihan din naman natin yung ibang nasasaktan doon sa mga pag-position ko laban sa administrasyong na to ganun nga (I also understand that there those who get offended by my position against the administration, but that’s how it works),” he said. On December 7 last year, the local court issued an arrest warrant against Trillanes, a staunch critic of the Duterte administration, for four counts of libel. He immediately posted P96,000 bail or P24,000 for each case. On September 6 last year, Duterte and Carpio filed separate libel charges against the opposition lawmaker for accusing them of conspiring with Land Transportation Franchising and Regulatory Board Central Visayas director Ahmed Cuison in extorting Uber and similar companies during a radio interview with Leo Lastimosa of DYAB Cebu on September 8, 2017. The senator accused the two of being involved in corruption and extortion at the Philippine Road Board and Department of Public Works and Highways as part of their supposed corrupt tentacles and “shakedown”. Another charge was filed against Trillanes on September 19, 2018 for dragging the former vice mayor as well as his father President Rodrigo Duterte into the P6.4-billion shabu smuggling controversy during a phone patch interview in a news program of CNN Philippines on June 14 of the same year. A shabu shipment from China arrived in the country via the Manila International Container Port in Tondo, Manila on May 16, 2017. Lawyer, Rainier L. Madrid, counsel of the former vice mayor, said the tentative schedule of the mediation was set on March 21. “Should the court suspend proceeding, we will have to wait for 60 days after which the court set a hearing for mediation because this case of libel is ‘mediatable’,” he said.